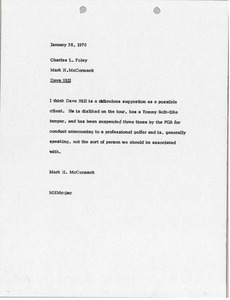 McCormack thinks that Dave Hill is a ridiculous suggestion as a possible client, as he is disliked on the tour, has a bad temper, and has been suspended three times by the PGA. 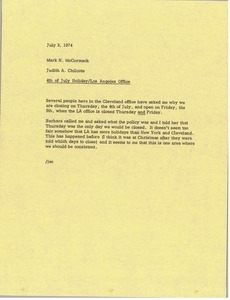 Chilcote explains that people are asking why the Cleveland office is open the day after the 4th of July, whereas the LA office is closed both days. 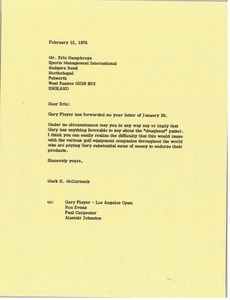 Responding a letter sent to Gary Player, McCormack informs Humphreys that he is not to imply or say that Player endorses the "doughnut" putter. 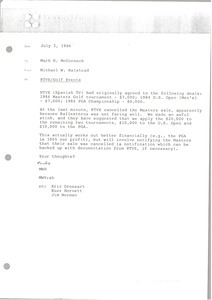 McCormack notes Player's contracts with other golf equipment companies. 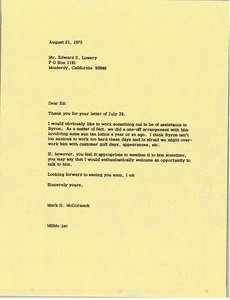 Concerning RTVE and golf events. Halstead notes that RTVE cancelled the Masters sale. 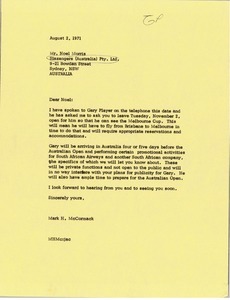 McCormack notes that Gary Player has availability and would like to see the Melbourne Cup. 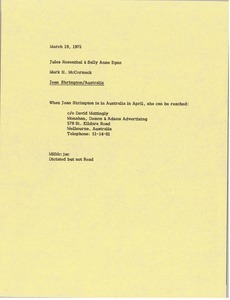 McCormack sends Jean Shrimpton's contact information in Australia. 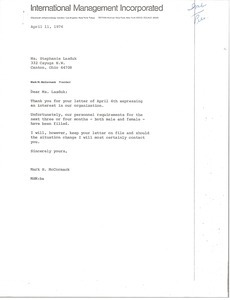 McCormack thanks Stephanie for her letter (See mums700-box0003-f017-i111), but informers her that their personnel requirements have been filled for the next three or four months. 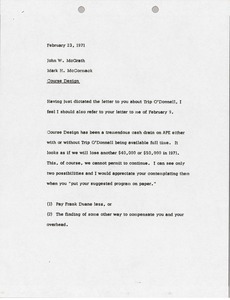 McCormack writes regarding "Byron", presumably American professional golfer Byron Nelson. 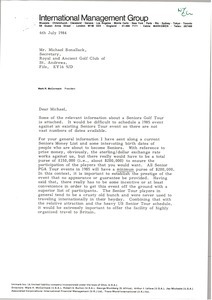 McCormack sends information bout a Seniors Golf Tour.